The following guide shows the Sinister Presence locations for each Sinister Presence in Level 60 Chronicles and Expert Dungeons that make up the “Dreams of War” achievement that rewards the title: “The Sinister”. Once you complete the “Dreams of War” achievement you are given a quest that concludes the Sinister Presence’s involvement in the lead-up to the Plane of Water RIFT 3.0 Expansion. There’s a whole bunch of Sinister Presences found in Level 60 Chronicles. Below is a quick summary of each location – you can also find an expanded walkthrough with supporting images here. Each Sinister Presence spawns after you kill the neutral “Tormented” add. Right outside to the left of the Haunted Terminal building just as you finish the runspeed mini-event. Right after the first boss, Abido Kyo at the end of the corner that you turn right at. On the platform right before the ship where the boss Rusila Dreadblade’s resides. The NPC is in-between the last two Longshot adds before Rusila. Right on the bottom-left side of the platform where the first boss is. The Tormented Empyreal Soldier NPC appears when you kill the first boss. The Tormented Blightleaf Guard appears just behind all the shamblers in the room just before the left-most boss. To get there, head straight up from the entrance till you hit the hedge wall. Turn left and keep going till the end, then turn right. The NPC is at the end of that ‘room’ behind all the shamblers. To the right of the entrance. If you’re only after the Sinister Presence, you can skip all bosses and even skip all the adds and head straight to the Tormented Destroyer. The area to the south of the Tormented Destroyer also sometimes contains a rare chest spawn and the rare mob Sinthis (a werewolf). At the front wall at the beginning of the Throne of the Rune King in the King Molinar and Prince Dollin boss encounter. Click here for full details for the locations of the Sinister Presence in Level 60 chronicles including map locations. There’s a whole bunch of Sinister Presences found in Level 60 Expert Dungeons. Below is a quick summary of each location – you can also find an expanded walkthrough with supporting images here. Each Sinister Presence spawns after you kill the neutral “Tormented” add. In the middle of the bridge located above the entrance to the instance (the one where you fight Tzul, the first boss). The Tormented Horror only appears after you kill the third boss, Emphalea (the Crustacean/Lobster). In the top-right corner just behind the third boss, C1-0N3. The Tormented C1-0N3 only appears after you have killed the third boss, C1-0N3 (Clone). On the map it is the top-left corner of the main room. In the middle-right side of Kaliban’s Bodyguards encounter room (second boss). Behind a book shelf in the library underground at the second boss, General Grim’s encounter area. The Tormented Blackstorm Assassin spawns after you kill General Grim. Just before the 3rd boss, Nemesis IV. After you defeat the 2nd boss, Jorthan, walk up the stairway and when you exit the stairway, turn right instead of the usual left and you will see the Tormented Titan. In the final instance with the final boss, Twisted Lord Twyl. Once you defeat Twisted Lord Twyl, the Tormented Bunny will appear near the green exit portal that teleports you back to the start of the instance (don’t teleport out if you want to kill the Sinister Presence). After the final boss Baron Slagstorm is defeated, Tormented Grunt will appear in a small outer section of one of the buildings behind him. You’ll need to do a small loop to get to him. In a small room behind a Fan after you kill the 3rd boss, Overseer Cowel. Just click on the Fan when you are close to it to destroy it so that you can get to the Tormented Stormwatch Guard behind. In the 4th boss Forgelord Helix’s encounter room. The Tormented Witchlord will appear in the same location as Forgelord Helix after the Forgelord is defeated. The Dreams of War achievement is found under Achievements (default key “h“) -> Dungeons. It involves killing all the Sinister Presences of every Level 60 Chronicle and Expert Dungeon and rewards the title: “The Sinister”. It also allows you to do the “No Beginning, No End” quest gained from Keeper Ivan at Tempest Bay. Each Sinister Presence also has its own individual 10-pt achievement for killing them. Once you’ve completed the achievement ‘Dreams of War’ that requires you to kill all the Sinister Presences in every Level 60 Chronicle and Expert Dungeon, you will be able to speak to Keeper Ivan right next to the Tempest Bay Porticulum to begin a quest “No Beginning, No End”. You will be sent to fight the real Sinister Presence off the West coast of Ember Isle. Simply click on the orb to spawn the Sinister Presence, kill it, then speak to Keeper Dria at Breaker Point on Ember Isle to complete this quest. The “Your Dreams Hate You.” achievement found under Achievements -> Zones -> Ember Isle requires you to kill 5 Sinister Presences on Ember Isle. Some of the locations you can use are (11616, 2961) and (11505, 3313) and (11637, 3860). Other locations include: (11466, 2862), (11426, 2928), (11504, 3315) and (11775, 3513). Thanks to Sinasay and Orminis@Typhiria for the locs! The Sinister Presences spawn and then disappear after a while. There’s multiple locations – more than the above. They may spawn around the spawn area indicated. This should get you all 5 kills required for the achievement. Hey do you have a clue how I get the achievement for the sinister Presence on Ember Isle? Since If got already all kills in the dungeons and got the title for it but the NPC wont have a quest for me. Keeper Ivan next to the Tempest Bay Porticulum doesn’t have a quest for you? Hmm, that does sound odd. Have you tried checking your mail just in-case there’s a prelude quest there? Or are you talking about the achieve “Your Dreams Hate You.” under Achievements -> Ember Isle? That achievement is separate from the Dreams of War + quest. There’s multiple Sinister Presences on Ember Isle that aren’t related to the quest. Unfortunately I don’t have the co-ordinates for those. Hey ethandir, I found three locations: [Image]. Just use the shard-hop feature and a target macro (like ‘tar Sinister’) and you should (hopefully) get all 5 done! Hey Khortish I tried all your locations on every server avaiable but wasn´t able to find even one sinister presence, be it with or without target macro, is there anything I have to use before I see them? You don’t need to use anything special. There’s probably a large variety of locations that the Sinister Presence spawns in but they appear and disappear from those locations. If all else fails, try going from side to side on the map covering the entire underwater area whilst spamming your target macro and being at around half-way between the surface of the water and the sea floor (to hopefully have your target macro reach all locations). I was able to find at least 2-3 Sinister Presences in those locations (whilst switching between shards) but that may have just been luck. 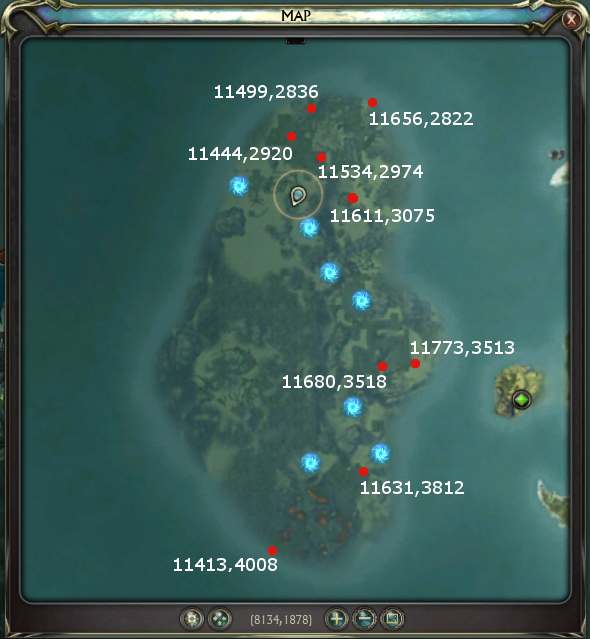 The sinisters for the Ember Isle achivement Your Dreams Hate You have more spawnpoints then stated above.